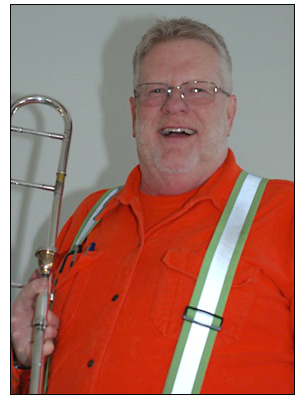 Tim Streagle grew up in coastal Virginia playing and listening to the sweet sounds of the trombone. So it was no surprise that he spent much of his youth playing in dance clubs on the road and performing in cover bands. He performed with several jazz luminaries such as Arturo Sandoval, Frank Foster, Jon Hendricks, Rich Little, Wayne Newton, Jon Faddis, and Ellis Marsalis. He was a member of or performed with the Temptations, Four Tops, O Jays, Ringling Bros. Circus, Carnival Cruise Lines, Smithsonian Jazz Masterworks, Kennedy Center Terrace Theater Jazz Series, Richmond Symphony, and Great American Music Ensemble. It was not always lucrative, though, so playing studio work and doing commercial jingles was an important source of income. His clients included Pepsi, Pic-n-Pay Shoes, BASF Corp., Ford Motor Co., Bruce Hornsby, and many more. "Perhaps my favorite memory from that period was when I was walking on the bar, playing my horn at Sloppy Joe's in Key West," Streagle recalls. "Those were fun times!" He transitioned to teaching in higher education as a music theory professor and applied lesson instructor at Virginia Commonwealth University for almost 10 years before putting his horn away to make an abrupt career change. He spent the next 13 years working for the Boy Scouts of America, Heart of Virginia Council as a property manager and maintenance technician. Then his wife's new job at Idaho State University (in the Education department) brought him to his present employment with ITD, first with the McCammon maintenance shed in District 5, and then at the three-person Murphy shed in the remote southern reaches of District 3. "I took the job in McCammon because it was available," Streagle explained. "With my particular skillset, I had few options in Idaho in the music world, and maintenance was a good fall back. It turned out I enjoyed it more than I thought I would." "Murphy is truly remote and I love it here," he added. "Little snow and beautiful scenery." "I have enjoyed my time working in southern Idaho and plan to retire here," said Streagle. Tim enjoys fishing, astronomy ("I have waaayyy too many telescopes"), riding his ATV in the mountains, and camping with his wife, now a special-education coordinator with the state Department of Education. The couple now live in Nampa. "Perhaps the best thing about my work is having such great co-workers and being outdoors. I also enjoy working on road projects with the crew. The teamwork aspect of the job is very fulfilling when it all comes together well. Serving the public has been a common thread throughout my life, and that only continues as a Transportation Tech. 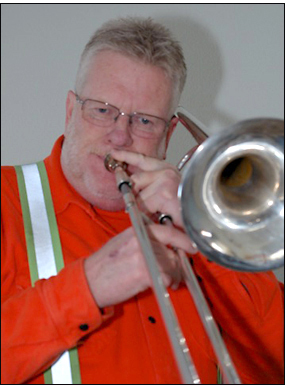 As he has moved west, he has had to shelve his childhood passion, replacing the smooth sound of the horn with the sweet notes of the highway. "I like the solitude of being out on night patrol during the winter. Seeing the night animals and noticing the bright stars in the night sky never gets old. Everyone that knows me sees my computer skills as a strength, but in all honesty, I prefer to leave the desk as much as possible!" "When I first relocated to Idaho, I tried playing in some Idaho Falls-area big bands, but they were too far away to be practical. I only play occasionally at home for my own enjoyment now." No, he doesn't play out at the Murphy shed, although the occasional four-legged audience member makes a verbal request. "Unfortunately, coyotes don't understand jazz, I'm afraid…"